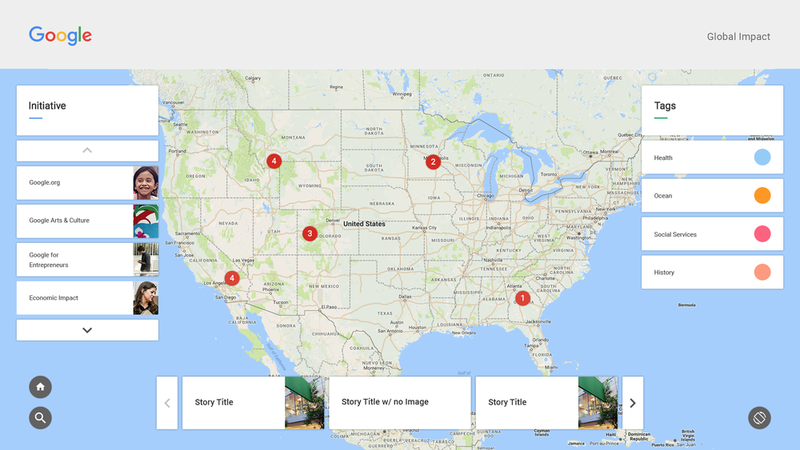 Working with Google's Policy Team, our own team created a content display system intended to show case studies of Google backed projects for social good at their Google Partner Plex in Mountain View, CA. Though the physical environment had already been built for previous Google exhibits, we designed and developed a complete software ecosystem from scratch in a very short window of time to give them precise control over content to be displayed in ways that appealed to the range of important individuals visiting the space. With a robust interactive podium for the host to navigate, the encompassing wall display presents easily digestible project information for the guest audience following along with the host’s presentation. Effective categorization, search, and filter features give the host quick access to content relevant to particular interests of the audience members present, allowing her to easily adapt the narrative on the fly. Taking the lead from the art director and working off the framework provided by our UX team, my place was in helping design a flexible, bulletproof visual system for both the surrounding wall display of content and the podium interface controlling the presentation. Though the experiential nature of the wall display fell squarely outside much of Google’s typical display formats, design choices all referenced their existing visual guidelines to carry through the familiarity of the brand. As in any CMS based design system, establishing a visual language is only the first step. Referencing our inventory of all foreseeable content types the client could potentially plug into the system, rulesets were established defining minimum/maximum values for text fields, media dimension requirements, and a predetermined selection of color values for labeling content. The implementation phase of the project required extensive communication and collaboration with the development team to ensure visual integrity of the designed system was accomplished spot on and in a very brief window of time.